Raced by Art Hasselbach of Consolidated Models, Inc. This pre-war tether car was originally owned by Art Hasselbach, Sr., the owner of Consolidated Models, Inc. of the Bronx, NY. Before founding Consolidated Models in 1939, Hasselbach was employed by United Airlines, working on US military projects in the research and development area. 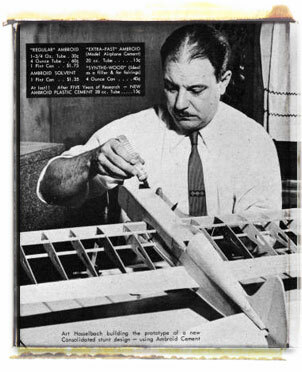 Hasselbach was an avid model builder and sought to take the knowledge he had gained at United and apply it to building model aircraft. 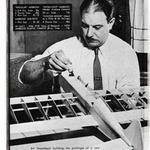 First starting a hobby shop in the basement of his father-in-law's print shop, Hasselbach began producing pre-fabricated model airplane kits made of balsa wood. As his business grew, Hasselbach formed Consolidated Models. Hasselbach raced this car on an indoor tether car track inside the Knightsbridge Armory in the Bronx. But little else is known about the history of the car, and it is not known whether Hasselback actually designed and built the car or purchased it from someone else. The car is an excellent example of an early pre-war streamliner and features a cast aluminum body, a Forster .29 spark ignition engine with a custom built drive unit, and Peerless wheels and tires.